On this special evening, Harkat celebrates the art of Urdu poetry in our first gathering of Mumbai’s young shayars. 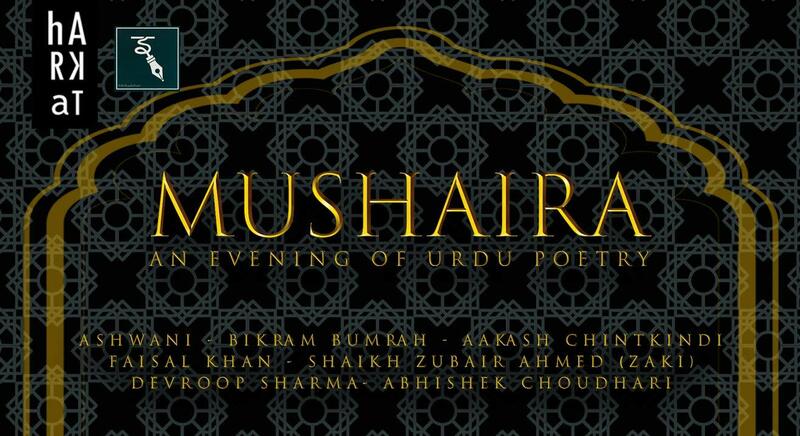 You can experience a mélange of the old and the new in the ancient atmosphere of a traditional mushaira. Harkat is transformed into a dimly lit room with old world charm as poets share in an intimate mushaira circle accompanied by a traditional oil lamp. Their melodies and verse resonate with an audience that surrounds them in a circle, creating an evening of poetry and community. Join Ashwani, Bikram, Gaurav, Faisal, Zaki, Smita, Devroop and Abhishek as they travel through themes of nature, love and humanity. A poet of the ‘Shringar’ Rasa, Ashwani writes poems of love and employs sarcasm and satire in his work. A young Shayar from Punjab and an engineer by profession, Bikram’s Punjabi & Urdu poetry is inspired by elements of nature and human emotion. A new sensational addition to the Mumbai's poetry circuit. He recently went viral with his poem Lord Ram..
Faisal began writing shayari as a teenager and is currently one of the youngest shayars in the Mumbai poetry circuit. A shayar of the ‘Sharmila mizaaj’ temperament, Zaki’s work exhibits a mastery of the Urdu language. Having taught herself Urdu, Smita is known for her use of personification and aims to evoke the senses with her writings. Devroop combines simplicity of style with an evocative performance skill, making him a rather quotable shayar. A Mumbai based college professor and a follower of the traditional school of shayari; Abhishek is a self-taught shayar and has been writing since his college days.